"You may think you know what you're dealing with, but believe me, you don't." The greatness of Chinatown is more than just cinematic—it will forever frame the way that you think about Southern California, especially if you live there and you've got to write out monthly checks to the Department of Water and Power. For decades now, Robert Towne's script has been lauded as The Great American Screenplay, which is probably too much for any one project to live up to—but there's no doubting that it's an astonishing, brilliant, dark work, with gifted artists not just doing the writing, but on both sides of the camera. In many ways it's the perfect fulcrum for the changes in Hollywood with the death of the studio system and the abandonment of the Hays Code—it honors the storytelling techniques of decades worth of detective stories and noirs, while telling an explicit and excruciating story that would have been impossible to film even just a couple of years before, without the changes wrought by movies like Easy Rider. It's a work of art of the highest caliber, but it's also not above telling a dirty joke—it's really kind of impossible to overstate what a terrific movie this is. There's no ignoring its highbrow pedigree—if you take the opening line of Anna Karenina ("All happy families are alike; all unhappy families are each unhappy in their own way") and combine it with Balzac's famous dictum that behind every great fortune, there is a crime, you might come up with the Crosses of Los Angeles. But that may be getting ahead of the game, just a bit: Jack Nicholson stars as J. J. Gittes, wise guy private eye in L.A. in the 1930s whose stock in trade is tracking philandering husbands and wives for their respective spouses, so that appropriate blame can be apportioned in divorce court. The movie opens with his newest client: Evelyn Mulwray is certain that her husband is stepping out on her, and Gittes and his associates soon discover that the gentleman in question is in fact one of Los Angeles' most prominent public servants, Hollis Mulwray, chief of Water and Power. This is one of those movies in which to describe too much of the plot is sure to spoil much of the fun for the uninitiated—suffice it to say that Gittes soon learns that he's been set up, and that the consequences associated with what might have been a run-of-the-mill divorce case are more profound than he could have possibly imagined. Nicholson is extraordinary in the role, which was tailored for him by Towne as perfectly as the natty period suits he sports—it's his smartass persona in the service of the story, and it's a tribute to his talent that he shines so brightly while having to do so much of the heavy lifting of the storytelling. And he's not flying solo, either—Faye Dunaway is the necessary femme fatale, at once imperious and vulnerable. It's a great performance from her, in a run of them, including Bonnie and Clyde and Network, and a reminder of how vital she was to the success of some of the best movies of the period. And equally remarkable is John Huston, as the villain of the piece—his presence alone ratifies the status of this as a great detective movie, for director Roman Polanski clearly pays homage to Huston's The Maltese Falcon, and Gittes and Sam Spade are kindred spirits. Huston is at once avuncular and sinister, affable and terrifying�he doesn't have all that much screen time, but his Noah Cross is simply indelible. Huston's presence also gets at some of the uncanny resonances that have to be due to the story reflecting life when the cameras stop rolling. For instance, while the movie was being shot, Nicholson started a years-long romance with Huston's daughter, Anjelica—and when Noah Cross asks Gittes about his own daughter, "Are you sleeping with her? ", you sense not just two actors filling it up, but a stern father taking the measure of the latest rapscallion who deludes himself into thinking that he's good enough for his little girl. More brutally, there was the recent history of the movie's director—his wife, Sharon Tate, eight months pregnant, had been slaughtered in unconscionably graphic manner by followers of Charles Manson, so the notion that beautiful L.A. could hold the darkest secrets and the worst outcomes for pretty young blondes had to have had a deep personal resonance for the director. It is, in many ways, a movie about the darkness of the human heart, and the neighborhood of the title, where only a very small portion of the film's running time takes place, looms large as a symbol of no good deed going unpunished. It's also a film that continually flatters the intelligence of its audience—Polanski and Towne know that we can hold on to a question for a little bit, and can connect the dots, and can be trusted, even if we can't say the same for everybody up on the screen. And it is an unbelievably beautiful production as well—John Alonzo's cinematography pays its respects to the films of the 1930s while figuring out a color scheme that's evocative of black-and-white pictures yet still giving us the crispness of color; production designer Richard Sylbert's work is meticulous, a dollop of Deco here, a bit of Arts & Crafts there; and the assembly by editor Sam O'Steen is impeccable. The last reel of the movie has one of the most shocking reveals in film history, on par with Max von Mayerling's marital history in Sunset Boulevard, and the last, fatalistic moments of the film are unquestionably the stuff of true tragedy. It's hard even to fathom how devastating this movie can be, and it's one that will always stay with you. Image Transfer Review: The film looks brighter and sharper than on its previous DVD release—it still shows some fading of color endemic to many of the pictures of the period, though, but that almost works in its favor, for as some of the saturation has bled out, it looks that much more like our collective image of the past. Audio Transfer Review: The 5.1 track sounds a little too fussy; the restored English mono track is the way to go, limited dynamics and all. Extras Review: This DVD re-release is billed as a Collector's Edition, but the tantalizing prospect of extensive supplementary materials soon vanishes. Nicholson, Towne, Polanski and producer Robert Evans have all participated in new interviews, which are sprinkled generously through three accompanying documentaries. The Beginning and the End (19m:30s) goes over the project's history, and how Towne wrote the part specifically for Nicholson; Filming (25m:36s) has many, many stills from the set, and The Legacy (9m:40s) emphasizes Jerry Goldsmith's score (written in nine days! ), and the movie's warm critical reception. (The copy on the back of the package promises a fourth piece, Acting Chinatown, but it's not on the disc.) The only other thing here is an original trailer, and this all becomes sort of galling, especially when you discover that the film's far inferior sequel, The Two Jakes, sports a Nicholson commentary track. Where's the look at the history Towne used, or an excerpt from Carey McWilliams' Southern California: An Island on the Land? An appreciation of the film's impact (L.A. Confidential, to name only one prominent example), or its place in the noir lineage? Outtakes, deleted scenes, even just notes on Towne's planned third Gittes picture? Only on the DVD special edition of our dreams, alas. 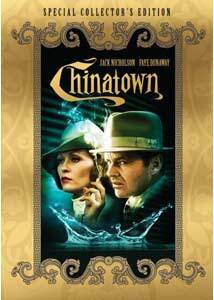 Forget it, Jake—every time you think you may have overpraised Chinatown, another look reveals that it's even better than you imagined or remembered. It is one of the great and indispensable movies of all time, though this Collector's Edition still doesn't give it quite the full-boat treatment on DVD it deserves, even if it looks better than ever.